Average Height	: 22" - 27"
Average Weight	: 62 - 82 lbs. Although not common in the U.S., this breed has a long history of service to man. The breed is believed to have been developed in the Piedmont region of Italy. As the Spinone is a very ancient breed (it is believed to be one of the oldest gun dogs in existence), it is not known exactly what the origins of the breed are; there are many different theories. Some of these claim that the Spinone could have originated in Italy, France, Spain, Russia, Greece, or Celtic Ireland. Some people familiar with the history of the breed claim that the Spinone descended from the now-extinct Spanish Pointer, whilst others claim that it was the ancient Russian Setter that is responsible for the breed we know today. An even more popular theory is that Greek traders brought coarse-haired setters to Italy during the height of the Roman empire, where the dogs were then crossed with various others and the modern Spinone eventually emerged. The French claim that the Spinone has descended from crosses of several French pointing breeds, whilst the Italians believe the Spinone is the ancestor of the Wirehaired Pointing Griffon, the German Wirehaired Pointer, and the Pudelpointer. Any one of these claims could be true; perhaps several of them are correct. During the Second World War, the Spinone became close to extinct. Both the war and the fact that Italian hunters had begun using other breeds (such as setters, pointers, and spaniels) in the hunt, whereas before it was primarily the Spinone. Many breeders had to resort to crossing the Spinone with other wire-haired breeds, such as the Boulet, Wirehaired Pointing Griffon and German Wirehaired Pointer. The breed was not officially known as "Spinone" until the early 19th century. Before then, some areas knew the breed as the "Spinoso". The breed may have been named after an Italian thorn bush, the spino, which was a favorite hiding place for small game because for larger animals it was practically impenetrable. Only thick-skinned, coarse-haired animals could fight through the branches unharmed to locate the game. The Spinone was the breed most capable of doing so, and, perhaps, therefore the name was formed. Today the Bracco Italiano is the most popular hunting dog in Italy, although the Spinone is still common. 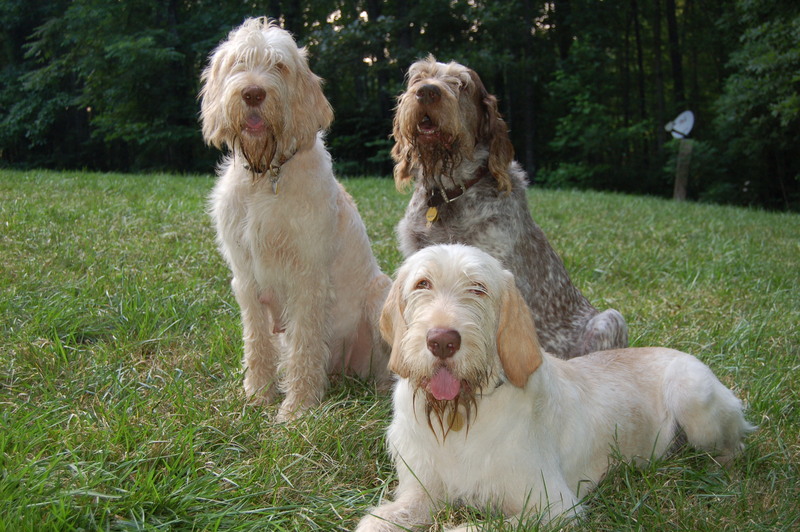 The Bracco is a racier, higher energy dog, while the Spinone excels at hunting close or in dense cover, and in retrieving from water. The Duchess of Northumberland has a spinone, called Fuzzy. The breed is known as Italy's all-purpose hunting dog. Some say it is a cross between White Mastiff, French Griffon and the coarse-haired Italian Setter, bred with the dogs that were left by Greek traders and others from the Adriatic coast. However this is not proven and the dog's rather uncertain heritage centers around Europe and its gun dogs of long ago. Whether he was the basis for bringing forth other gun breeds, or whether they simply sprang from common stock is not known. Like all Italian breeds it is ancient. In Renaissance Italy a pointer with wiry hair was already present. After 1950 the breed was reconstructed by a few great breeders. The dogs have a great sense of smell, setting, retrieving, recovering, and very close ties with the hunter. The breed has excelled as a pointer and retriever for centuries. Today he is still a popular hunting dog in other countries, as well as a pet. The Spinone Italiano is an Italian dog breed. It was originally bred as a versatile gun dog. To this day, the breed still masters that purpose. The Spinone is a loyal, friendly and alert dog with a close lying, wiry coat. It is an ancient breed that can be traced back to approximately 500 BC. It is traditionally used for hunting, pointing, and retrieving game (HPR), but, in addition to that purpose, the intelligent and strong Spinone may be practically anything ranging from a companion to an assistance dog. The Spinone is easy going, docile, and affectionate towards both people and dogs. It is well known for being loving and gentle with children. Its extremely patient nature also helps with this, but children should be taught not to take advantage of this trait. It is loyal to those it knows and still friendly to those it does not. The breed is not known for any aggression and is therefore not a wise choice for somebody looking for an aggressive guard dog. Centuries of working with man as a hunting companion has created a loyal, intelligent dog that is easily trained, although some can be stubborn about performing a learned task if they see no point in it. Because they are sensitive, motivational training works best for this breed, as this gentle creature's feelings can easily be hurt when handled incorrectly. The Spinone can be a very active breed, but it is not a racy dog like most other hunting breeds. The Spinone typically moves at the relaxed trot that is characteristic of the breed. It has often been called the perfect dog to run or jog with, because it will not run off in front and leave its human companion struggling to keep up as it prefers the slower pace itself. It can be more than happy in a small yard and does not necessarily need acres of land. The small garden combined with regular walks would suit a Spinone well. In part due to its long beard and lip folds, the Spinone can have a tendency to slobber. The Spinone Italiano is typically an easy going dog breed that is lovable and calm. Very caring towards children, the Spinone Italiano is often s treasured part of the family. Affectionate even towards those the dog doesn't know, this particular dog breed doesn't have any major concerns with aggression or too much territorialness. Of course, knowing this, the Spinone Italiano is not generally a good choice for a guard dog or protector breed. The intelligence of the Spinone Italiano is something that needs to be addressed during the training of this dog. And while this breed will learn quickly, they are often better motivated by a reward system more than other techniques. That said, the Spinone Italiano does like to showcase their talents for you, so once they know that you will respond favorably, they are more than happy to follow your commands. They like to show boat at times, appearing to be regal as they point out their hunting finds, for example. If you can find out what makes them happy and allows them to show off their intelligence, you will have a dog that's more than happy to oblige. Though the Spinone Italiano does have energy, it is not as neurotic or energetic as some hunting dogs or other domesticated breeds. Moving at a relaxed trot is more this breed's style. However, many owners find that the Spinone Italiano is an excellent running or jogging partner as they can keep up the pace. What's more is that this dog is not one that will run off when you are running together, choosing instead to move at a more relaxed pace. The calm persona of this particular breed can be disquieting to some, as they are much more willing to go at their own pace than to resort to someone else's. If you are an active person that likes a lot of interaction between you and your dog, this might not be the best choice for you. The Spinone Italiano is more of a deliberate dog than one that will take kindly to working at someone else's pace. With its short to medium length coat, the Spinone Italiano is not a difficult dog to care for in terms of grooming. Shedding little, you may find that a trip to a professional groomer is the easiest way to deal with your pet's coat, but regular brushing with a coarse brush will help to maintain the coat's health. The trip to the groomer is sometimes advised as the fur is coarser and can be hard for some owners to manage. A weekly brushing is usually sufficient for this breed, as they tend to be more self-grooming, like a cat. An active breed, the Spinone Italiano is a dog that wants to roam around as often as it can. As a hunting dog, this is a dog breed that is perfectly suited to retrieving, pointing, and hunting, if trained to do so. But this dog is also able to provide the perfect companionship to those who need assistance with everyday tasks. This dog breed is perfectly suited to a small yard and will enjoy regular walks as a way to get outside and stay active. Remember too that this is a dog breed that is perfectly content to go for runs or jogs with their owner, without being the one that runs off or causes the owner to have to struggle to catch up. You may want to create a regular routine for this dog that will allow them to get outside and stay active for about an hour a day. This will help them release any pent up energy as well as help to keep them healthy. While this is a dog that can stay at home when you are away from work, you will want to make sure it gets some regular activity or else it can become bored and restless. This highly intelligent dog is able to pick up new things and tasks quite easily, though it's also the Spinone Italiano's intelligence that can hinder their training just as easily. If the Spinone Italiano doesn't feel that the task is necessary or useful, they may resist completing the task. A reward system of training is the most recommended route, as the Spinone Italiano is a sensitive dog that can have its feelings hurt if handled in a brusque manner. Loyal and intelligent, this dog breed will enjoy learning new tasks. Remember that this dog breed needs to be told that they are doing well when they are doing well, and gently criticized when not- it will make a world of difference. Very capable of learning complicated tasks, don't be surprised if this breed resists some similar tasks. Again, this is generally because the dog doesn't feel that there is a 'point' to what it is doing, so you may need to work harder during these kinds of tasks. For example, some Spinone Italianos are not willing to grab a fake bird during a training session for hunting, but will go after a real dead bird with little prodding. You will want to find a reward for this dog that they will genuinely look forward to during their training. This might be something like chew toy or a food treat that will help motivate them during simple tasks. If you choose something that they do not enjoy, be prepared for them to dismiss it and you. This may take a few tries to find something that is going to motivate the dog, but once found, this will be an invaluable training tool. If trained properly, this dog breed is perfectly suited for the hunter, someone who may be visually or physical disabled, as well as for someone that simply wants a companion. They will feel useful and helpful in these situations which allows them to show off their intelligence.